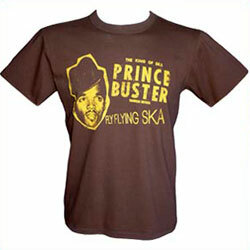 Spotted online is this Prince Buster t-shirt, featuring the man complete with a slightly wonky pork pie hat. It’s made by Anon and is a brown t-shirt with mustard lettering. As well as the image of the ska legend, the wording says "The king of ska – Prince Buster – touring Britain" and "Fly flying ska". Made of 100% cotton and available in all sizes, it sells for £22.